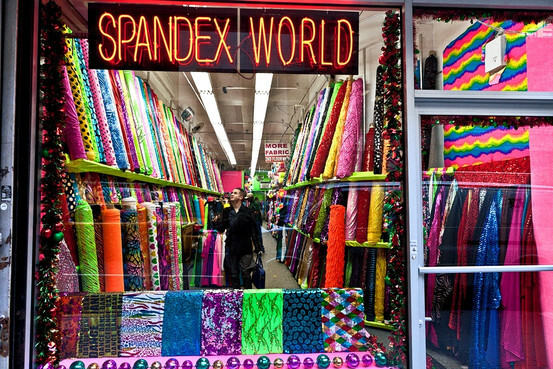 Poll: What's Your Favorite Garment District Fabric Store? Hey readers, I'm curious to know which Garment District fabric stores you consider your favorites. Since I shop on my lunch hour I tend to be partial to the ones closest to my office: Mood Fabrics and Elliott Berman Textiles, which both have wide selections. Take the poll below and let us know your top picks for Garment Center fabric stores. 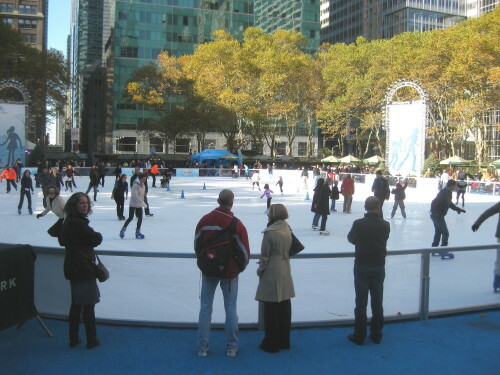 The ice skating rink at Bryant Park is NYC's only free admission ice skating rink. If you're in the Garment District area between now and the end of December, take a walk over to Bryant Park at 40th and Sixth Avenue. The holiday shops are open, and browsing the unique items in this festive setting is a welcome break from pawing through bolts of fabric. I was there last week and bought a funky Japanese calendar for my daughter in college and two black-and-white photos of Yankee Stadium for my 15-year-old son. Plus I had a major celebrity sighting. Hours: Monday - Friday 8 a.m. - 6 p.m., Sat 9 a.m. - 3 p.m. I have ambivalent feelings about shopping at SIL Thread in the Garment District. On the one hand, when I need notions and dressmaking supplies and I'm already in the Garment District, it's my go-to store when I don't have time to shop around. But "service with a smile" and "it's all about the customer" don't seem to be important management mantras here. Questions are answered with a yes or a no and nothing more; don't even think of asking a "which is better to use, this or that?" kind of question unless you like getting blank stares. "Not far from Times Square in Manhattan, reams of fabric and rows of buttons still line the corridors of West 38th and 39th streets in the Garment District.The area, once full of the city's top fashion houses and garmentos who sewed buttons and stitched patterns for the city's retail shops, has been shrinking for decades." I wish I could say it's an optimistic piece and that zoning issues are being actively resolved to the benefit of garment district businesses. Read the entire article by Shelly Banjo here. You might want to stop postponing that future shopping trip to NYC's Garment District…. Hotels in the Garment District Area: Any Recommendations? "When I make the trip to NYC, I take along a roll of package tape, a Sharpie, a ball of twine, scissors, and those wire and tube handles they sometimes give you at stores to hold the handles of your shopping bag together. I also try to put at least 2 Priority Mail boxes (flat) in my suitcase. My good friend Cidell of the sewing blog Miss Celie's Pants was in town this past week for a little Garment District shopping, and she stopped in at Quick Fuse & Cut on W. 36th Street to get several yards of fabric fused with interfacing. Read her adventures in fusing here, and if you aren't familiar with her blog do check it out. Cidell has one of the freshest, most original voices in sewing blogdom; I keep telling her I wish I was a literary agent and knew how to package her to land her a book deal. I'll do my best to post a review here of Quick Fuse & Cut soon. Where Do You Grab a Bite in the Garment District? Honestly, I am the last person to ask for Garment Center area restaurant recommendations. Most days I eat yogurt at my desk so I can save money to buy more fabric. But readers have asked that I compile a list of decent restaurants in the Garment District and vicinity, and I think that's a good idea. Today I met three sewing friends for lunch at a new vegetarian fast-food place, Loving Hut, at Seventh and 30th, and we all licked our plates. What about you, STGD readers? Where do you like to eat lunch in this general area? Meet for dinner or cocktails? Leave me a comment here or email me, and I'll put together a list to post on this site. Thanks! Hours: Monday - Friday, 9 am to 6 pm. Closed weekends. Trims and fashion hardware are obviously selling well in the Garment District. Mood Fabrics expanded its trim department about a year ago and now Botani, long known for its buttons, has leased the retail space next door and added a new fashion hardware section. Plus they've turned some office space in the back of the store over to Lampo zippers and trims. Head over the Lace Star pronto (215 W. 40th St., NYC) if you want to catch the final days of their 25%/40-off sale. I popped in at lunch today and it was only because I exercised great restraint that I didn't walk out with anything. Brocades, laces, trims and anything with beading are 25% off; the rest of the store is 40% off. This means you can get silk charmeuse for around $10.80/yd and 4-ply silk around $23/yd. I don't think you can do better than that in the Garment District right now, so grab your shopping bag and get over there fast. Believe it or not, there's a lot I don't know about the Garment District. Rather than take a guess and pass on misinformation that will live forever, I'd prefer to open up reader questions to STGD readers. So please, if you know the answer to questions posed on this site, raise your hand and leave a comment! "Do you know of any good shops for linen shopping? I am most interested right now in looking at some stretch linen (sort of an oxymoron) to see how it handles and drapes. I remember seeing a "linen-only" shop on 36th or 37th a couple of years ago. Any insight?" Hey Laura, I know B&J Fabrics has a decent linen section because I just looked at it last week. What about you, readers? Any recommendations for linen sources? "Help! I'm trying to find silk lycra printed fabric. I purchased a DVF blouse and to my horror it had a metal zipper in the back that wasn't flattering and incredibly cold. I had to return it but then I decided I'd make my own blouse, but I'm having a really hard time finding silk lycra in prints. Any suggestions?" Snow, Mood Fabrics has a ton of silk lycra prints. This would be my starting point. You could also check Elliott Berman Textiles. Chime in, readers, if you've seen silk lycra prints elsewhere in the Garment District. Wondering where to find something? Send me an email at lindsaytdesigns [at] gmail dot com. If I don't know the answer I'll post your question here on STGD. Got Any Questions for Kenneth King? The always fabulous Kenneth King has agreed to do an interview for Shop the Garment District. You're probably already familiar with Kenneth, creator of "one-of-a-kind, made to measure pieces for women and men, as well as limited edition pieces for boutiques," frequent Threads contributor, FIT professor, and sewing instructor extraordinaire. If you have any questions for him that pertain to shopping or finding things in New York's Garment District, please leave me a comment here and I'll ask him. Thanks! "I just wanted to suggest adding maybe one comment/fact to your review on Chic Fabrics. They are probably the best source for silk organza in the garment district—$7/yard, always. I'm sure other places occasionally have sales or whatever and you might be able to find silk organza for less, but Chic Fabrics has a good color selection and a consistent low price. Kenneth King recommended that I get my silk organza there when I took an online class with him - that's how I found it!" If you have tips about shopping in the garment district that you'd like to share here, send me an email at lindsaytdesigns [at] gmail dot com. "Shop the Garment District" is brand-new and evolving—I'm not even sure I know what I want it to be—but I'd love your input on what I can do to make this site a return destination for those of us who love the stores and services of NYC's Garment District. In fact, I'm looking for contributors, so if you're a Garment District regular (or even semi-regular) and would like to share news and tips or write posts, do let me know. I want this site to have more takes on things than just mine. I'd love it if you help me spread the word about "Shop the Garment District"; feel free to copy and paste the STGD button on Lindsay T Sews. And check back soon or add this to your RSS feed, as I plan on having a giveaway soon of a not-readily-available dressmaking notion or two. Stay tuned! Mayor Bloomberg announced yesterday six initiatives to help bolster New York City's threatened Garment District. Strategies include Project Pop-Up, an annual competition to promote new and innovative retail concepts, and Fashion Campus NYC, which will provide up-and-coming fashion and retail management professionals with additional opportunities in the industry through business seminars led by industry executives, networking opportunities, and an online resource with information on living and working in New York City. The program is expected to roll out next year. I'm encouraged, people! Read more about Mayor Bloomberg's announcement here. I don't know exactly why B&J Fabrics hasn't been on my list of fabric stores I immediately think of when I need more fabric. Maybe it's my perception that they don't carry anything that costs less than $50 a yard. Maybe it's the way the you browse for fabric by looking at "headers" hanging on a rack, rather than by pulling out bolts of fabric from shelves. I always feel a little self-conscious when I'm at B&J, like maybe I need to be carrying a more expensive-looking handbag or wear pricey and uncomfortable shoes.